I’ve been designing my 9 year old daughter’s bedroom in my head since we moved in last year. I knew I wanted it to be fun and eclectic yet mature enough for a 9 1/2 year old going on 12! 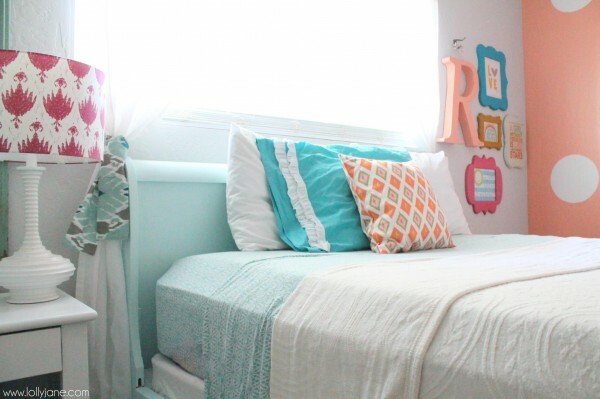 What we ended up with was a coral tween girl bedroom that I’m in love with! I put together a Pinterest board with lots of ideas for this room specifically, love the mix of random colors and patterns I ended up with. Sadly, I lost all my before pictures in a sudden hard drive crash last week. However, if you follow us on Instagram [@lollyjaneblog], you’ll have seen progress pics along the way! We started off with the blue sleigh bed as the inspiration. My girl loves blue but I didn’t want it to overpower the room. 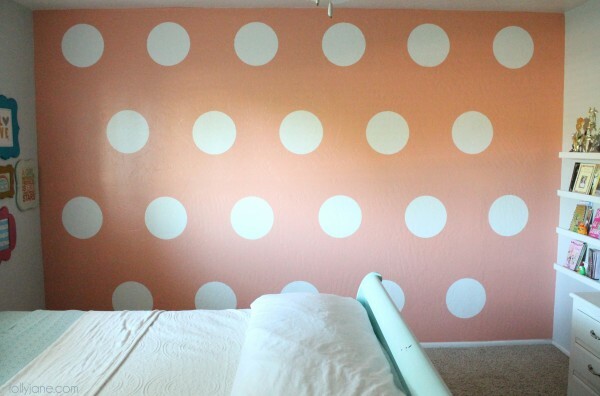 Ry agreed an accent wall with giant 20″ polka dots would be fun so we painted it a fun coral color (Coral Bliss by Dutch Boy.) She helped me apply the vinyl polka dots and she painted the whole wall while I did the edging, so proud of her! For the rest of the walls, I decided a pretty gray would be perfect and wouldn’t take away from the pops of turquoise and yellow I was using everywhere else. 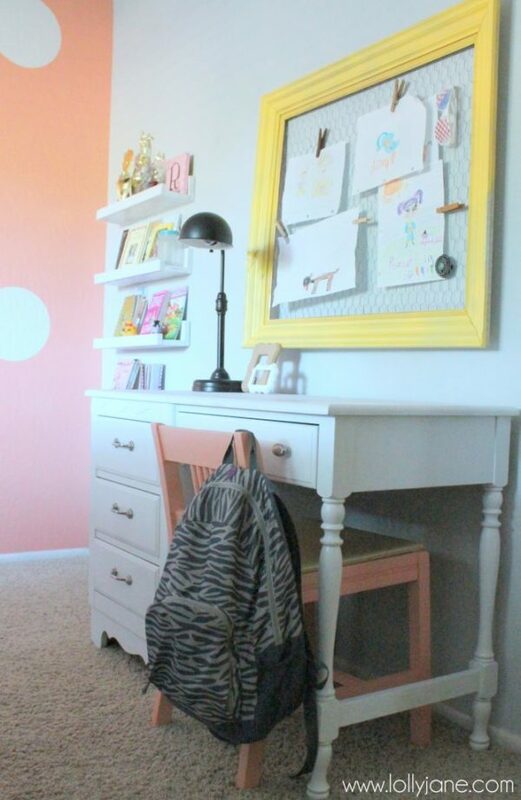 Dutch Boy Paint has the perfect gray shade, Timberwolf. Best part? I used Dutch Boy Refresh which is low VOC paint, meaning it’s less harmful to my family and the environment. 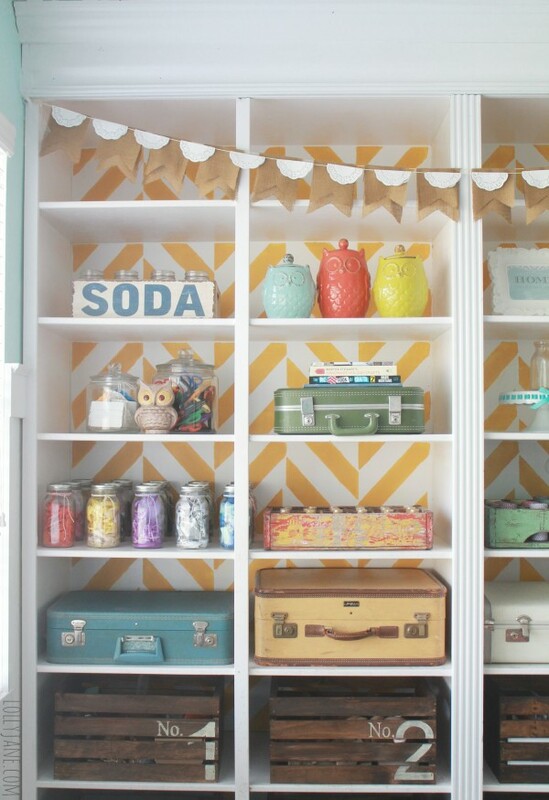 This paint uses Arm & Hammer odor eliminating technology to reduce household odors. It is the ideal paint for beautifying rooms—like kitchens, bathrooms, and basements—and locking out odors. I’m in love with it! I love the shelves. They’re Ana White creations, she’s brilliant. I made all for for $8!!!-insane. They house all Ry’s trophies, books and knick knacks that typically junk up her small desk. The only other furniture in her bedroom is an end table. Ry is my pack rat kiddo, it’s difficult for her to keep it clean so I’m hoping less is more! Any tips to keep her organized, btw?! Her end table houses her cd player and her lamp and her journal is in her top drawer and that’s it. The closet for this room came with ugly gold trimmed sliding mirrors doors. Of course I replaced them! I found this shower curtain at World Market on this visit along with a clearance shower curtain bar for $5, score! I had my talented sis Katie sew a white band on the bottom for extra length. And since she cut the strip that held where the slits to hang the curtain are, I recycled that by cutting in into 2 pieces and made tie backs for the curtain. Reduce, reuse, recycle, baby! The awesome mirror was a find in Virginia cleaning out my late grandmother’s house. The coral frame is a 16×20 from Cut it Out Already. My sweet girl Ry is so kind to others. I knew I wanted display a small gallery wall full of inspirational pictures so I was really picky with what I chose. [All of these cute prints are available to purchase in different Etsy shops mentioned below.] The ‘Love’ one is because she’s just that, so loving. The ‘A girl without freckles is like a night without stars’ is because she hates her freckles, even though she has a light sprinkling across her nose like her mama…and they’re not even obvious, silly girl. The ‘Find Your Rainbow’ lets her know to find her own way in life. And the ‘You are my Sunshine’ was made by yours truly, get it free here. Frames: urquoise and pink frames are from Cut it Out Already, the other 2 were half off at Hobby Lobby, score! 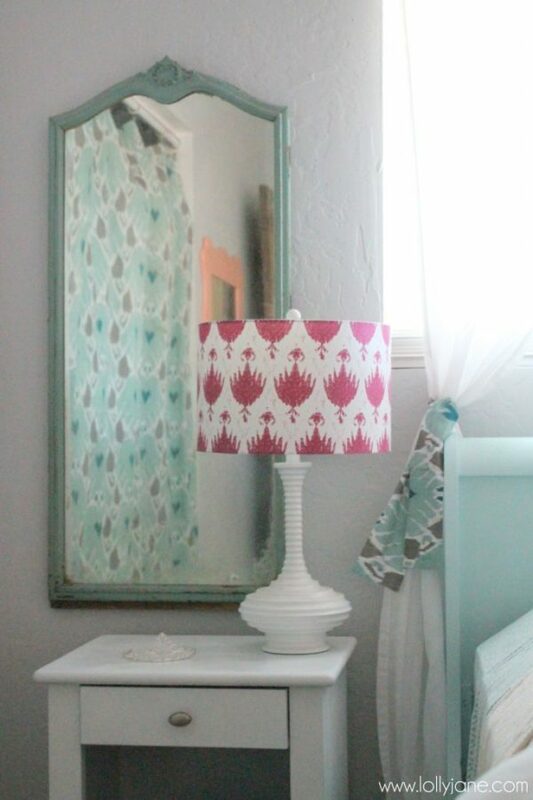 Love the lamp from TJ Maxx, too! 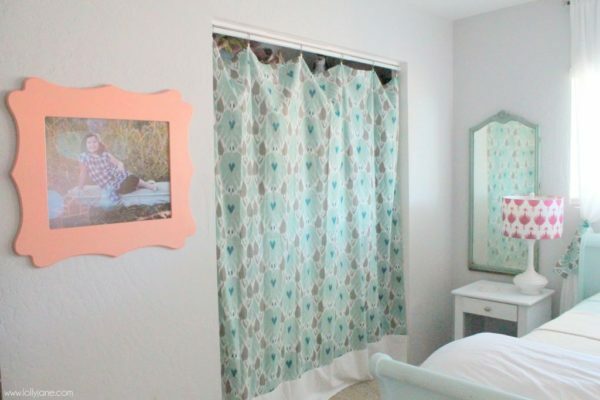 Hope you enjoyed her coral polka dot bedroom tour! It’s a fun and cheery room, now let’s hope she keeps it clean!! I have to give a GIANT thank you to Dutch Boy Paint! They hooked me up with this beautiful shade of gray for the walls that got me motivated to finish this room! Bed $40 from craiglist, refinished it. Dresser and night stand and mirror: free. Bulletin board: painted and chicken wire’d it: free. Already had all the bedding but the sheets were from Target last year, $19/sale. Curtains from Ikea, $9 for both panels. Shelves: $8, I built them myself. Total cost: $122, not too shabby! and my coastal master bedroom. LOVE LOVE LOVE!!! The colors are so fun, I love the inspirational quote area, so important for these beautiful girls! Glad you caught that, girls DO need all the confidence in the world! I love love love the color combo, what a fabulous room!! Thanks Megan! It’s pretty cheery! LOVE it! What a cheerful space. 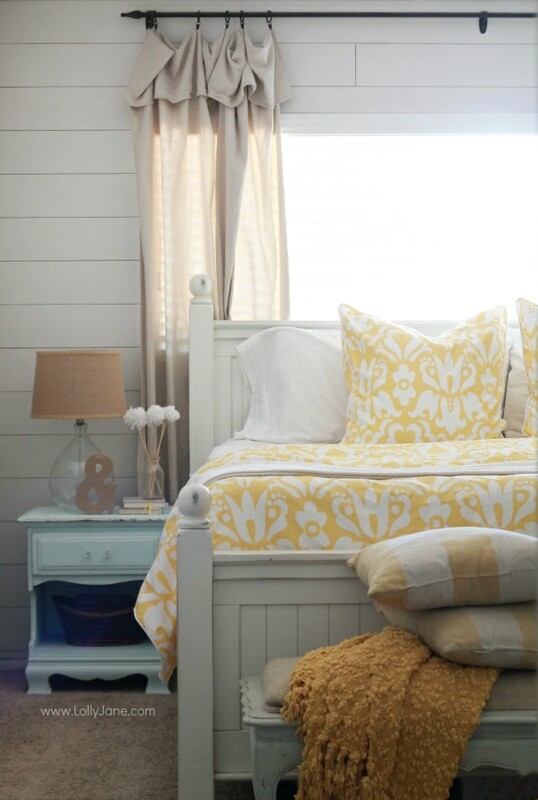 Quick question- what is the paint color you used on the bed? 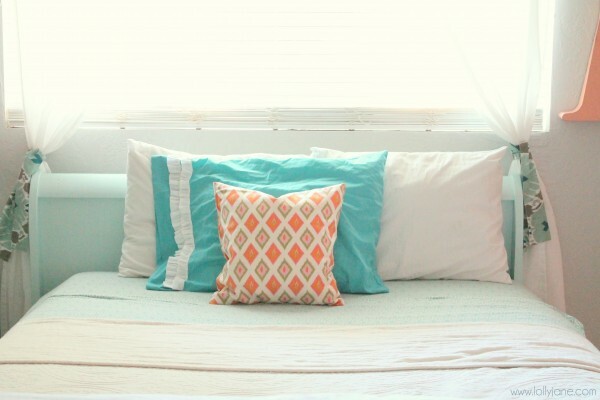 And did you make the orange patterned throw pillow? The bedroom turned out beautifully! Love the color scheme, especially. 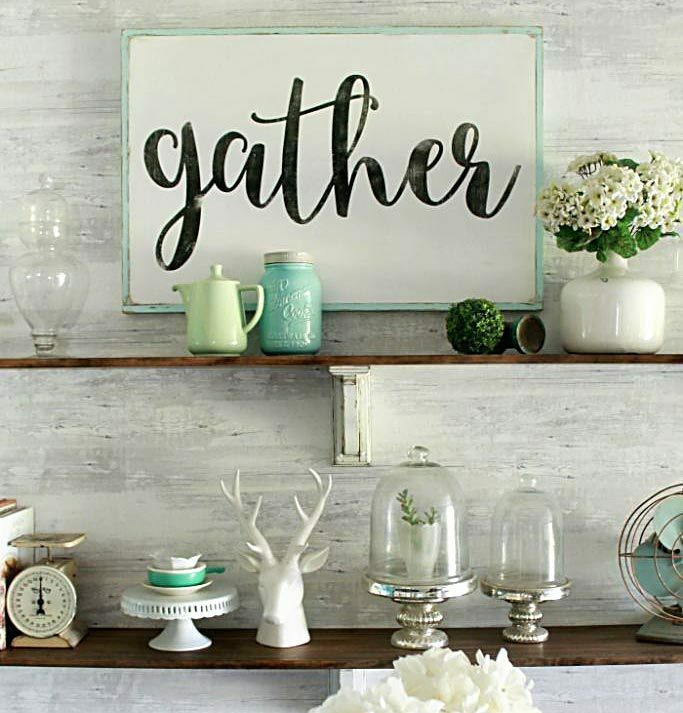 You added so many fun, colorful elements…it’s impossible to pick a favorite! This room is beautiful. I have a link party on Wednesdays, and I would love it if you would link this and any other posts. It is called Wednesdays Adorned From Above Link Party. It runs from Wednesday to Sundays. Happy Saturday! I just LOVE this room! BEAUTIFUL!!!! you are too much kelli!!!!!!!!!!!!! so great seeing it all put together. seriously- you are a superstar. Thanks, Jihae! We need to get our kiddos together. I’d love to have you over! If you’re going, we are! Excited to see you again! where do i get the freckles printable? I love it Kelli! You did a great job! 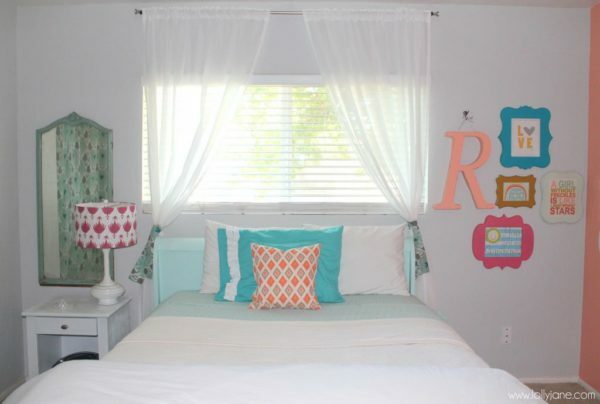 I love all the thoughtful details you put into her room – I know she’ll love it for a long time! 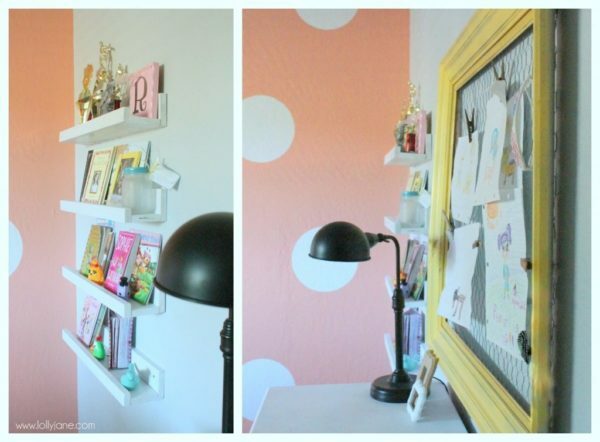 You both did a great job on the polka dot wall too – it’s so cute! I just discovered you through Lizzy Jane and have to tell you how I adore the look and feel of your blog! And the quote on the wall about freckles is awesome. My mom used to say I had the map of the stars written on my skin. Love it! That is one cute mom you have, love it! What a cute bedroom! I love the color pallette! I so love the color combo! I came here from Frugal Friday. I Love this!! soo cute! the colors look so good together! thanks for sharing! Thanks Rachel! Love when our readers can relate to our style! 🙂 Where are you in AZ? Loving the weather right now! what an adorable room! 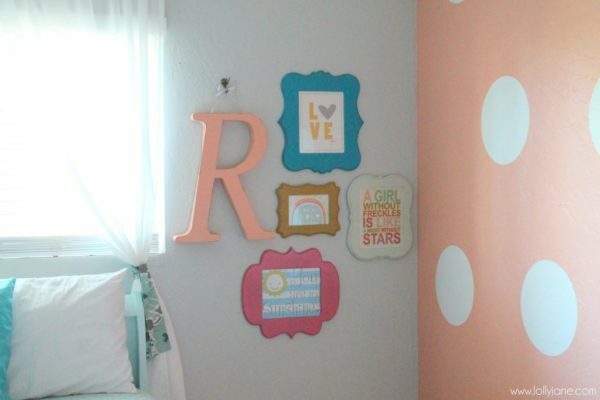 love the color palette and i love that polka dot wall- so fun! where did you get the large vinyl polkadots and how much did they cost? Very Cute! Can I ask what name is the coral paint? Hi Amber, we had to paint the frames. Check the post for the Etsy shops, we just updated them for the exact and similar styles 😉 Thanks! Where did you get the lampshade from? Love the color combo! Thank you Autumn! The pillowcase was made by our sister Katie; her Etsy shop is Sew Dew It and the sheets are from Target 🙂 They are a cotton jersey set but doesn’t look like they’re available online anymore. I would check in store, good luck!